Post your Sunday School ART lessons, ideas, activities, and resources for the Beatitudes. 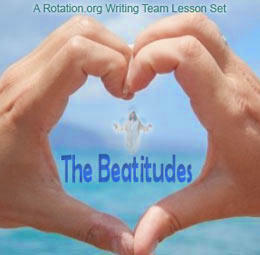 Bible lessons and ideas about the Beatitudes -with Art, craft, painting, construction, drawing, etc. Kids write Beatitudes in permanent marker (or with paint markers) on the outside of a large plastic jar (small fishbowl size), and then fix colored tissue like stained glass on the INSIDE of the bowl/jar using a very thin coat of "modge-podge" (glue). After applying the tissue to the inside, give it one more coat on top of the tissue. It will dry clear and shiny. "Beatitude Reminder" slips will be placed in the jar. Alternately, you can type various beatitudes and copy onto paper and cut in strips to modge-podge to inside of the jar BEFORE applying colored tissue to the back of it. Use copier or laser printer, as inkjetted beatitude text will smear when you apply the glue. Now....while the project is drying... Collect, copy and distribute 7 to 10 slips of paper with "beatitude reminders" on them ("Blessed are the peacemakers...make peace with a classmate today"). Students take home and remove a strip of paper each morning. They will take their jar home and each day this week open up and follow a beatitude for that day. A lesson originally posted by Jan from Napa. Each child will create a word poster as a reminder of attitudes and situations for which God blesses us. We are disciples devoted to God, when we do God’s will. When we do God’s will, we feel God’s blessings. God blesses those who follow Jesus. Students will learn that the Beatitudes, in the Gospel of Matthew, tell the story of Jesus explaining to his Apostles and the crowds of disciples or followers, what the characteristics of the community of believers are now and what they will be in the future. Students should understand that while the Ten Commandments tell believers what to do or not do, the Beatitudes describe how believers live as a community and work to bring heaven to earth. Children will learn to trust that God will take care of all who seek his kingdom and that Jesus’ followers will be blessed. Read the scripture passages and attend the Faith Quest Leaders Workshop. Prepare an opening prayer in case nobody volunteers to pray. Check the art room to see what supplies exist. Purchase needed supplies and make a sample. Duplicate the key Beatitude words printed in different font styles and sizes on various colors of paper (see link). Be sure that the duplicating ink will not run when covered with the Mod Podge. Prepare all the materials you will need for the creation process. Precut the poster board if necessary. Have the materials ready to go. There will be limited time for the creation process, so do everything you can to conserve time. Decide how you want to close the lesson. Prepare a prayer or use one of the group suggestions. Welcome the children and introduce yourself. Wear your nametag. Start the “lesson time” with prayer. Ask for volunteers, but plan on praying yourself. A short prayer thanking God for being a part of our lives would be appropriate. Ask Jesus to help us to follow his guidance so that we may bring goodness to earth. 1. Discuss the background to today’s story. Have the children use their Bibles to locate the verses in Matthew. This passage relates the central points of Jesus’ lessons. Similar to Moses going up to the mountain to bring down the Ten Commandments so that people would know how to be God’s people and how to treat each other, Jesus sits on the side of a mountain and expresses how God wants us to live now. 2. This is part of the Sermon on the Mount and the message that Jesus preached was unlike anything the people had heard before. Instead of living to become rich and powerful, they were to live as a Christian community overcoming hardship and finding happiness through belief in God’s kingdom. He told them not to take the easy path, but to take the right path. Just as it was important for Jesus’ disciples to listen carefully and follow the teachings, as disciples of Jesus Christ we should think and act together as a community to do good on earth. who depend only on him (need) - they belong in the kingdom of heaven. 4. Jesus does not promise that God will make life on earth easy. People will not win as individuals or gain material things. What they will achieve is of greater importance. They will find the kingdom of heaven and possibly even bring some of it to earth by making the world a better place. A Christian community working together may find such a reward, just as Jesus did. 5. Take a minute to talk to the children about the creation they are going to be doing in this workshop. Tell them that they will make a collage of Beatitude words. Remind them that God has given us all gifts of creativity. 1. Create! Show the children a sample that you have made. 2. Have the children put on smocks. Pass out materials. Every child should have a heavy piece of cardboard or poster board and scissors. Colored tissue paper, dishes of Mod Podge with brushes, and preprinted words will be shared by all. 3. Steps: Have the children select and cut out “God blesses those people who” and affix it to the backing with thinly brushed Mod Podge. Then they can surround this with several other words from the Beatitudes and shapes cut from colored tissue. When they have all the pieces arranged and glued, they can coat the top surface so that it will shine. 4. Clean up! Mod Podge dries permanently hard so wash everything carefully. Involve all kids in this so that you will have time to share together in the closing. You may want to have a prearranged signal or sound for clean up and tell them at beginning of the art project what that will be - perhaps giving them a 5 minute warning and then the final clean up notice to allow those who need a bit more warning that they need to complete whatever they are working on. 5. Turn out lights and lock the classroom door when leaving. Ask the shepherds to pass out Journals and pencils/markers. The children should spend a few minutes reflecting upon the morning's lesson – Why did Jesus preach this message? When bad things happen, why shouldn't we give up? What does it mean to bring heaven to earth? They may come up with their own questions. Draw a picture of yourself being kind to someone. 1. Encourage the children to think about Jesus’ message and how they can make the world a better place where they and others will be blessed. 2. Say the Key Memory Verse together (see above). You may want to have this verse printed on a banner and hung in the room, write it on the white board in the room, or have it on slips of paper that each child can take home. 3. Pray! Ask the children if they have any prayer requests. Thank God for sending Jesus to show us how to live so that we can do what is right and be blessed. Refer to this post over in the Drama Topic, for an idea that combines drama and art to create "Pair Poses" - the shape of the Beatitudes. Students use their bodies to "pose" each Beatitude and transfer that pose to one of several possible mediums, Then, using paint, they add to their pose designs or props to conveys what their pose and Beatitude phrase is all about. Example: for "blessed are those who mourn...shall be comforted," one kid posed sad and painted their tracing all grey, while the "comforting kid" posed with their arm around the sad kid. The comforter figure was colorfully painted, and their color was starting to flow over into the grey kid. Sounds powerful!